I’ve been making mooncakes every once in a while, but never quite get a chance to post them on my blog before the actual Mid-Autumn festival, so I thought I’d start making them a little earlier this year. Luckily, I made enough to last til tomorrow! I’m not a fan of the traditional mooncakes, so I always make the snowskin variety which is just as well since they’re not so full of saturated fat and sugar. My usual recipe uses a custard filling which is quick and easy, but I thought I’d try something different this year, using a mung bean filling instead and some red bean as well. It’s a bit more work, because you have to soak, cook and mash the beans but we quite enjoyed the taste, as it was a little more subtle than the egginess of the custard version. 1. Sift together the rice flour and corn flour. Set aside. 3. Remove from heat and quickly mix it into the flour mixture. Continue mixing until it becomes a soft ball of dough then put in fridge to cool. 4. Cook the paste with the sugar until dry, add the oil. Mix the cornflour with water and pour into the mixture- cook until thick. For the red bean paste, you can choose to use your own recipe, or buy the packaged version to save time. You need roughly 200g of red bean paste. 1. Divide the mungbean and red bean filling into your desired number of portions and roll into balls (depends on the size of your mooncake mould- I made around 16). The red bean balls should be smaller than the mung bean ones. Flatten a mung bean ball, and place the red bean ball inside. Roll the mung bean around the red bean ball so that it encloses it. Repeat with all filling. 3. Roll out the ‘skin’ so that it is flat and wrap around the filling (it will bevery thin). Dust with extra cooked glutinous rice flour and then put in mould to shape. 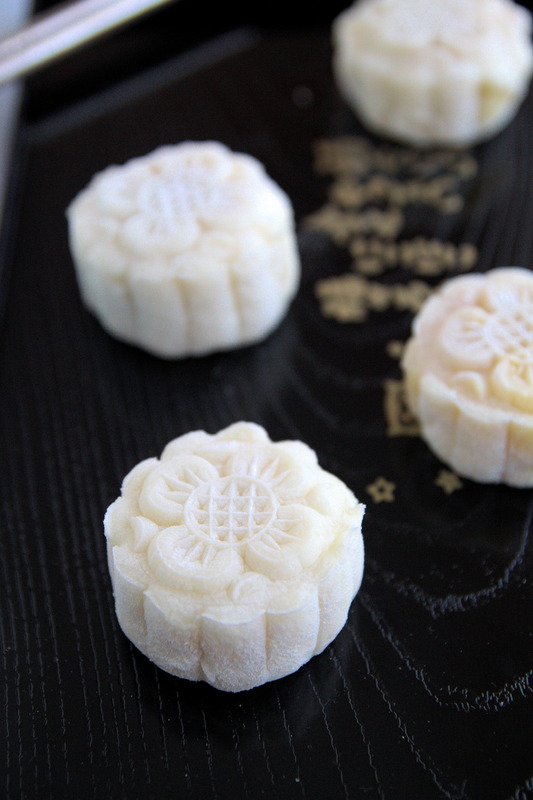 Note: These mooncakes are quite soft, especially the skin component, sothey are quite difficult to shape! What lovely looking cakes and that filling sounds amazing. wow! yum! red beans are so popular here in Thailand, especially in desserts! This mooncakes look so pretty!! Nice post.